Why is it that shards of glass shine so brightly in the sun? Their brokenness is illuminating; their brokenness is perfectly imperfect, and they are a fitting analogy to our lives. They’ve shattered – sometimes mysteriously, sometimes purposefully. And once shattered, the pieces never fit back together in quite the same manner. And that’s okay. From brokenness comes unique beauty, slivers of increased confidence and shards of perseverance. We may be broken, but we strong and we are nothing less in the eyes of the Son. When we feel that life breaks us, we likely feel alone. You may have felt as if God was absent in your life during those moments. But, God is never absent, not even for a moment. He walks with us through every trial and circumstance, every challenge and difficulty. If God feels absent, He is asking you to put more of your faith in Him; He is asking for a higher level of faithfulness from you. Oblige that request and have faith that He is rebuilding you for something incredible, something you may not be able to see right now. 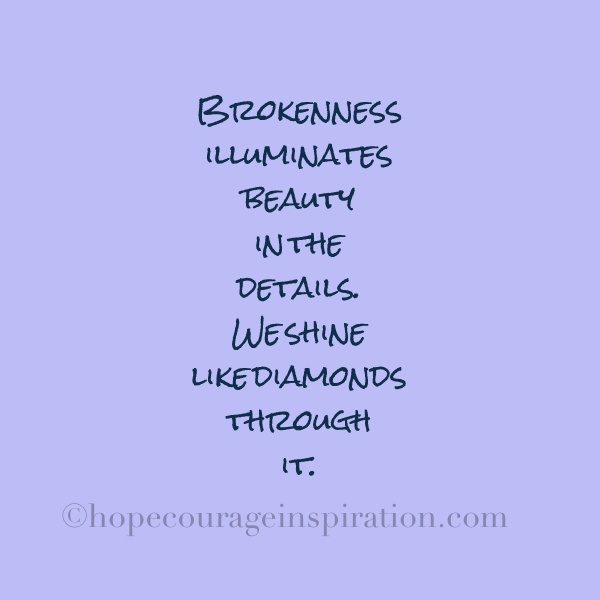 Brokenness illuminates beauty in the details and we shine like diamonds through it. It gives us a new, and sometimes uncomfortable, perspective. As you learn to navigate the prism of your life, hold onto hope, amplify your faith and remember that He is always with you.